Tendinopathies are common and difficult to resolve due to the formation of scar tissue that reduces the mechanical integrity of the tissue, leading to frequent reinjury. Tenocytes respond to both excessive loading and unloading by producing pro-inflammatory mediators, suggesting that these cells are actively involved in the development of tendon degeneration. The transcription factor scleraxis (Scx) is required for the development of force-transmitting tendon during development and for mechanically stimulated tenogenesis of stem cells, but its function in adult tenocytes is less well-defined. The aim of this study was to further define the role of Scx in mediating the adult tenocyte mechanoresponse. Equine tenocytes exposed to siRNA targeting Scx or a control siRNA were maintained under cyclic mechanical strain before being submitted for RNA-seq analysis. Focal adhesions and extracellular matrix-receptor interaction were among the top gene networks downregulated in Scx knockdown tenocytes. 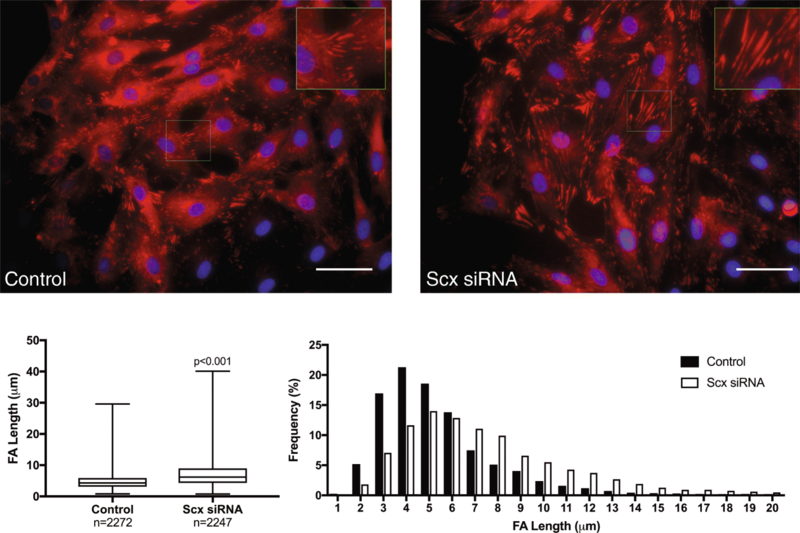 Correspondingly, tenocytes exposed to Scx siRNA were significantly softer, with longer vinculin-containing focal adhesions, and an impaired ability to migrate on soft surfaces. Other pathways affected by Scx knockdown included increased oxidative phosphorylation and diseases caused by endoplasmic reticular stress, pointing to a larger role for Scx in maintaining tenocyte homeostasis. Our study identifies several novel roles for Scx in adult tenocytes, which suggest that Scx facilitates mechanosensing by regulating the expression of several mechanosensitive focal adhesion proteins. Furthermore, we identified a number of other pathways and targets affected by Scx knockdown that have the potential to elucidate the role that tenocytes may play in the development of degenerative tendinopathy. Musculoskeletal injuries are common and affect people of all ages, fitness levels, and socioeconomic groups, as well as many animal species, including horses and dogs [1, 2]. Tendon and ligament injuries in particular account for a significant percentage of musculoskeletal injuries each year, with this number expected to rise along with an increasingly sedentary and aging population . Because dense collagenous tissues such as tendon and ligament are slow to heal and the natural healing process often results in the formation of scar tissue, these injuries are particularly problematic . The inability to regain normal tissue structure and mechanical properties often leads to tissue degeneration and chronic reinjury. Despite the frequency at which these injuries occur, and the associated loss of function and productivity they engender, there are few effective treatments available . Tendinopathies are particularly difficult to treat due to their chronic and degenerative nature, which no current treatments are able to adequately resolve. This lack of treatment options is due in part to a lack of understanding of the basic biology of resident tendon cells, called tenocytes. Tenocytes are responsible for the synthesis and maintenance of the normal tendon extracellular matrix architecture in response to physiological load . Decreased production of collagen and upregulation of catabolic enzymes and pro-inflammatory mediators by tenocytes in response to both excessive loading and unloading implicates these cells as a primary driver of degenerative tendinopathy [6, 7]. A better understanding of how tenocytes sense and respond to physical strain could therefore lead to more effective treatments. Much of the available information regarding tenocyte behavior has been gleaned through investigation of the basic helix-loop-helix transcription factor, scleraxis (Scx). Scx is frequently used as a tendon marker, and is critically involved in both the development of force-transmitting tendons in mice and the tenogenic differentiation of stem cells [8–10]. Mechanical load increases Scx expression [11, 12] and Scx is required for the pro-tenogenic effects of cyclic strain on stem cells . Scx also plays a part in regulating the response to mechanical load in adult mice, with decreased expression following tendon unloading and increased expression in response to physiological load [14, 15]. Taken together, this information demonstrates an important, but not well-characterized, role for Scx in tenocyte mechanotransduction. To gain better insight into how Scx facilitates tenocyte mechanotransduction, we used small interfering RNA (siRNA) to knock down expression of Scx in adult equine tenocytes and subsequently exposed them to cyclic mechanical load. The resulting transcriptome was sequenced with RNA-sequencing (RNA-seq) technology and compared to that of control tenocytes. We hypothesized that Scx mediates tenocyte mechanotransduction via regulation of a specific subset of previously unidentified, mechanoresponsive genes. For the initial transcriptome study, tenocytes were isolated from the superficial digital flexor tendon (SDFT) of a 5-year-old light breed female donated to the Virginia-Maryland College of Veterinary Medicine (VMCVM) for reasons unrelated to this study. All procedures, including tissue harvest, were performed with IACUC approval. Immediately following euthanasia by barbiturate overdose, the tensile region of both SDFT were aseptically excised, stripped of the paratenon, minced into small pieces (2-5 mm), and digested in growth medium (Dulbecco’s modified Eagle’s medium [DMEM; 4.5 g/L glucose], 10% FBS, 2 mM L-glutamine, 50 μg/mL ascorbic acid, 25 mM HEPES, 100 units/mL penicillin, and 100 μg/mL streptomycin) containing 0.075% collagenase type 2 (Worthington Biochemical, Lakewood, NJ) and 0.06 μg/mL α-ketoglutaric acid overnight at 37 °C, 5% CO2, and 90% humidity. Cells were strained, pelleted, and plated at 6000/cm2 in growth medium. Growth medium was exchanged every 3 days and cells were passaged upon reaching 70% confluence using 0.25% trypsin-EDTA. For cohort validation studies, tenocytes were isolated and passaged in the same manner from the SDFT of 6 additional light breed horses (mean age 5.8 ± 3.3 years; 4 females, 2 castrated males) donated to the VMCVM for reasons unrelated to this study and under IACUC approval. Tenocytes were used at passage 3 for all experiments. Tenocytes were transfected (Nucleofector™ system, Lonza, Cologne, Germany) with a siRNA targeting the equine Scx mRNA (Sense: 5’-AGAGAAAGUUGAGCAAGGAtt-3′, Antisense: 5’-UCCUUGCUCAACUUUCUCUgg-3′, GenBank ref. NM_001105150.1; Silencer™ Select, Ambion, Life Technologies, Carlsbad, CA) or a non-targeting scramble siRNA control (Silencer™ Select Negative Control No. 1, Catalog #4390843, Life Technologies). Transfection efficiency was evaluated using a fluorescein-conjugated scramble siRNA (sc-36,869; Santa Cruz Biotechnology Inc., Dallas, TX) and counting labeled cells by fluorescent microscopy. Cells were resuspended at 1 × 106/100 μL in Nucleofector™ Cell Line Solution V (Lonza) containing 10 nmol siRNA or scramble control, transferred to cuvettes, and nucleofected using the T20 program. Cells were recovered in growth medium for 15 min at 37 °C before plating at 200,000 cells/well on flexible silicone culture plates (UniFlex® Collagen type I coated; Flexcell International, Hillsborough, NC). Cells were allowed to adhere for 24 h before being synchronized in culture medium containing 1% FBS. After 18 h, cells were exposed to cyclic uniaxial strain (1%, 0.5 Hz, 2 h) every 24 h for 3 days. Thirty minutes after completion of the final strain cycle, cells were collected into guanidine isothiocyanate-phenol solution (TRIzol® Reagent, Invitrogen, Carlsbad, CA) for RNA isolation. The experiment was repeated 3 times to generate 6 total samples for sequencing (3 siRNA and 3 scramble controls). Cohort samples for validation by qPCR were generated in the same manner. Total RNA was isolated by column purification according to manufacturer instructions (Direct-zol Microprep, Zymo Research, Irvine, VA) and evaluated both spectrophotometrically for quantity (NanoDrop, Thermo Scientific, Waltham, MA) and by electrophoresis for RNA integrity (Bioanalyzer, Agilent, Santa Clara, CA). RNA from the same samples submitted for RNA-seq and the additional cohort were isolated and converted to cDNA for use in qPCR validation studies (High-Capacity cDNA Reverse Transcription Kit, Applied Biosystems, Foster City, CA). cDNA library prep and sequencing was performed at the Biocomplexity Institute at Virginia Tech. Total RNA (1 μg per sample) was enriched for polyA RNA (PrepX PolyA mRNA isolation kit, Wafergen, Fremont, CA) and converted to cDNA libraries (PrepX RNA-seq for Illumina Library Kit, Wafergen). Libraries underwent 13 rounds of PCR to generate the final cDNA libraries for sequencing. Individual sample libraries were clustered and sequenced on the Illumina HiSeq 2500 (average of 26.9 million paired end reads for scramble control and 29.3 million for Scx siRNA). Raw sequence data were evaluated for quality (FastQC)  and adaptor sequences and low quality reads were removed using Trimmomatic  prior to being aligned to the reference genome (EquCab2) using HISAT2  and mapped to known features (Ensembl EquCab2 version 90) using HTSeq . Differential gene expression between scramble control and Scx knockdown samples was determined using DESEQ2 . All fold changes are shown relative to the scramble control and on a log2 scale, unless otherwise stated. Genes with a ± 1.5 log2fold change and an adjusted p-value of p < 0.05 were used in functional annotation and gene ontology (GO) enrichment analysis of differentially expressed genes using the PANTHER Classification System (version 13.0, http://www.pantherdb.org/) and a false discovery rate of 0.05. KEGG Pathway analysis was performed with the DAVID Bioinformatics Resource (version 6.7, https://david.ncifcrf.gov/) and significance set at p < 0.05 as evaluated by modified Fisher Exact test (EASE score). Sequence data generated in this study have been submitted to National Center for Biotechnology Information Gene Expression Omnibus (NCBI GEO, https://www.ncbi.nlm.nih.gov/geo/) under accession number GSE110567. Differential expression analysis and normalized counts for all genes and samples are included as Additional file 1. Minor groove binding primer-probe sets were purchased (Scx, assay #Ec03818452_s1, Life Technologies) or designed for genes of interest identified by the transcriptomic analysis (Primer Express®, Applied Biosystems; Table 1). All primer-probe sets had an efficiency of > 90% as determined by serial dilution against a known template (TaqMan™ Master Mix, Life Technologies; StepOnePlus™ Real-Time PCR System, Applied Biosystems). Relative gene expression was calculated using the ΔΔCt method and the housekeeping gene glyceraldehyde 3-phosphate dehydrogenase (GAPDH) [21, 22]. Data are shown relative to the average of the scramble control samples for each gene. Cells were exposed to either the scramble control or Scx-targeting siRNA and plated on collagen type I coated tissue culture polystyrene (TCP) plates in the same manner described above for cells plated on silicone bottom plates. After 3 days in culture, cells were fixed in prewarmed 4% paraformaldehyde in dPBS + 0.3% TritonX-100 for 15 min at room temperature. Differences in cytoskeletal and focal adhesion morphology were investigated using a focal adhesion staining kit following manufacturer’s instructions (FAK100, MilleporeSigma, St. Louis, MO). Five random fields were acquired at 20× magnification per condition for each horse and used for analysis of cell morphological features (CellProfiler version 3.0.0, http://cellprofiler.org/). Tenocytes were cultured on silicone bottom plates as described above, or on collagen-coated TCP. Scratches were created using a 200 μL pipette tip 30 min following the end of the final strain cycle. Monolayers were rinsed once with dPBS to remove debris and covered with fresh culture medium containing 1% FBS. Images were taken at 0, 3, 5, 8, and 12 h post scratch formation to monitor cell migration into the scratch area (ImageJ, National Institutes of Health, Bethesda, MD). where F = applied force, k = spring constant of the cantilever, d0 = deflection point during cell contact, α = half open angle of the tip, v = Poisson’s Ratio (0.5), and δ = indentation [23, 24]. Triplicate force distance curves were collected and averaged for at least 8 cells per condition and repeated for each horse in the cohort (n = 7). All statistical analyses were performed using SAS Studio 3.6 (SAS Institute Inc., Cary, NC). Unpaired Student’s T-Tests were used to assess differences in gene expression, cell stiffness, and morphometric data. Migration assay data were analyzed by mixed model ANOVA with Tukey’s post hoc testing using the PROC GLIMMIX procedure. Model fit was evaluated by examining studentized residual plots. Statistical significance was set at p ≤ 0.05. Box and whisker plots represent the median value and 25th and 75th percentiles, with whiskers denoting the minimum and maximum values. All remaining data are shown as mean ± SD. Transfection efficiency using the described protocol was > 95% beginning approximately 24 h post-nucleofection and remained > 95% until at least 96 h. Exposure to Scx siRNA using the described protocol resulted in an average knockdown of approximately 57% (p < 0.001), as measured by qPCR, in cDNA made from the same samples submitted for RNA-seq (Fig. 1a). As an initial validation of the RNA-seq data, Scx expression was compared between the two methods. The current annotation of the equine genome (EquCab2) does not include Scx as a feature, presumably due to the poor quality of the equine genome upstream of the Scx gene and incomplete information regarding the 3′ end of the Scx coding region. Alignment of RNA-seq reads to the equine Scx mRNA sequence (NM_001105150.1) revealed a substantial GC bias that decreased the total number of mapped reads (Fig. 2). Nevertheless, in samples exposed to Scx siRNA, the number of reads mapping to the Scx mRNA was significantly decreased (p = 0.014) compared to the scramble control (Fig. 1b). A total of 11,166 annotated transcripts (out of 26,922) were detected in tenocytes, with 10,231 expressed in both control cells and those exposed to Scx siRNA. An additional 747 genes were expressed in only the control cells and 188 were expressed only in the Scx knockdown cells. The top 25 most highly expressed genes, regardless of Scx knockdown, are shown in Table 2. Vimentin (VIM), a fibroblast marker, was the most highly expressed gene in our dataset. The two major tendon extracellular matrix proteins, collagen types Iα2 (COL1A2) and IIIα1 (COL3A1), were among the most highly expressed genes and were unaffected by Scx knockdown. The small leucine rich proteoglycans decorin (DCN) and lumican (LUM) were both highly expressed and significantly (p < 0.001 for both) increased in Scx-depleted tenocytes; however, the fold changes did not meet the inclusion criteria (log2 fold change of >/< 1.5) to be considered for differential expression (LUM = 1.21 log2 fold change, DCN = 0.72 log2 fold change). To further confirm the identity of the cells as tenocytes, data were examined for expression of tendon-enriched genes . Sixty out of 68 of the previously reported tendon-selective genes were present in our dataset (Table 3). The data were also parsed for changes in the expression of other tendon-related genes (Table 4). Expression of collagen types Iα1 (COL1A1) and 5α1 (COL5A1) were decreased, as was expression of the glycoproteins tenascin-C (TNC) and cartilage oligomeric matrix protein (COMP) and the proteoglycan aggrecan (ACAN). Expression of matrix metalloproteinases (MMP) -1 and − 3 was relatively low and unaffected by Scx knockdown. Conversely, MMP-13 expression was increased and MMP-2 expression was decreased in Scx-depleted cells. Of the 11,166 annotated transcripts detected, 1002 genes met the threshold for differential expression (411 upregulated and 591 downregulated genes in Scx depleted tenocytes compared to controls). GO analysis of differentially expressed genes revealed a number of biological processes affected by Scx knockdown (Table 5). Downregulated genes exhibited significant enrichment in processes involved in cell-matrix adhesion (4.8-fold, p = 0.037), transmembrane receptor protein tyrosine kinase signaling pathway (2.8-fold, p = 0.046), cell differentiation (2.1-fold, p = 0.006), and developmental processes (1.6-fold, p = 0.007), among others. Genes upregulated by Scx knockdown showed significant enrichment in processes including oxidative phosphorylation (6.6-fold, p = 0.02), mitochondrion organization (5-fold, p = 0.009), translation (3.2-fold, p = 0.011), and transcription from RNA polymerase II promoter (1.97-fold, p = 0.022). Differentially expressed genes were overlaid onto KEGG database pathways to further define specific pathways affected by Scx knockdown (Table 6). In agreement with the GO analysis, the extracellular matrix-receptor interaction (3.5-fold, p = 0.014) and focal adhesion (2.3-fold, p = 0.017) pathways were enriched in genes downregulated by Scx knockdown. Pathways represented by upregulated genes included oxidative phosphorylation (6.4-fold, p < 0.001), ribosome (6.4-fold, p < 0.001), and several neurodegenerative diseases, including Parkinson’s (6.3-fold, p < 0.001), Alzheimer’s (4.4-fold, p < 0.001), and Huntington’s disease (3.8-fold, p < 0.001). To confirm the biological significance of the transcriptomic data, the relationship between Scx knockdown and focal adhesions suggested by the GO and KEGG analyses was further explored. Several differentially expressed, focal adhesion-related genes, were chosen for validation of the sequencing data by qPCR in both the original samples submitted for sequencing and the additional cohort (n = 7 horses total). 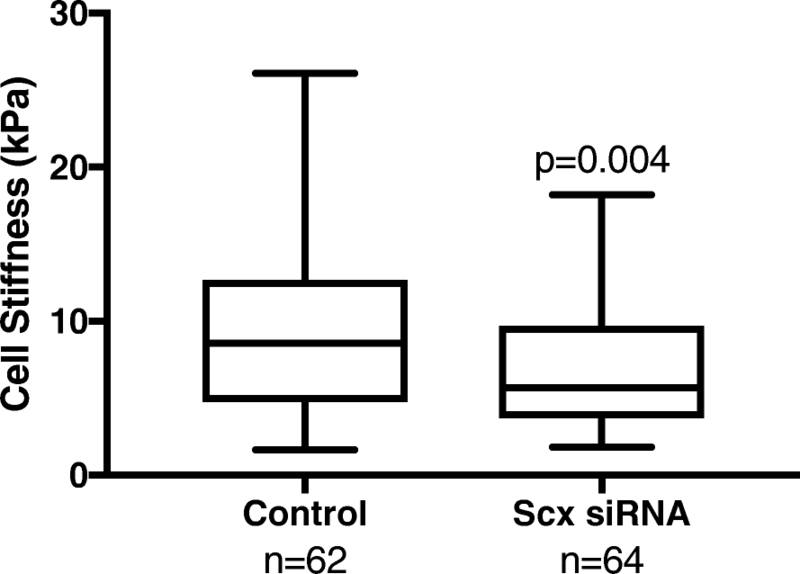 Exposure to Scx siRNA resulted in significantly decreased Scx gene expression compared to controls (Table 7; p = 0.036). The remaining genes quantified by qPCR showed comparable downregulation to the RNA-seq results (Table 7), and included several adaptor proteins and those that facilitate force transduction via focal adhesion linkage to the actin cytoskeleton (talin 1 and 2 [TLN1, TLN2], filamin B and B [FLNB, FLNC]; Fig. 3). Other downregulated genes, including breast cancer anti-estrogen resistance protein 1 (BCAR1, also known as p130Cas) and SHC adaptor proteins 3 and 4 (SHC3, SHC4), are key players in the regulation of cell migration by acting as scaffolds for tyrosine kinase-related signaling. Also downregulated in tenocytes exposed to Scx siRNA were several extracellular matrix components (collagen types Vα1, VIα2, and IVα2, laminin subunits α5 and β2, heparan sulfate proteoglycan 2, and thrombospondin 2), integrin subunits α3 and β3, and two regulatory subunits of protein phosphatase 1 (12B and 12C). Changes in cytoskeletal and focal adhesion structure in response to Scx knockdown were examined by immunofluorescent staining for the actin cytoskeleton and vinculin, a protein found in mature focal adhesions that was unaffected by Scx knockdown (Fig. 4). No overt differences were seen in the cytoskeletal organization; however, tenocytes exposed to Scx siRNA had decreased cytosolic staining of vinculin and longer vinculin-containing focal adhesions compared to controls (7.2 ± 4.3 and 4.9 ± 2.6 μm, respectively; p < 0.001). In addition, tenocytes exposed to Scx siRNA were approximately 40% softer than control cells (p < 0.001), as measured by atomic force microscopy (Fig. 5). Scx knockdown had no significant effect on cell area or nuclear shape (Table 8). There was no difference in cell migration between tenocytes exposed to Scx siRNA and a scramble control siRNA when cultured on collagen-coated TCP (p = 0.065; Fig. 6). When migration assays were performed on silicone membranes, however, there was a significant two-way interaction between plate type and Scx knockdown (p = 0.025). Though tenocytes tended to migrate slower on the silicone membrane overall, cells exposed to Scx siRNA were significantly slower to migrate on silicone compared to TCP at 12 h post-scratch creation (p < 0.001; Fig. 6). By using a broad, transcriptomic approach followed by biological validation, we identified several novel Scx-mediated processes with important implications in understanding tenocyte behavior. Equine tendon fibroblasts exposed to siRNA targeting Scx were softer, showed an impaired ability to migrate on softer surfaces, and exhibited differences in focal adhesion morphology compared to controls. Together, these findings suggest a potential role and mechanism for Scx in modulating tenocyte mechanotransduction. The results of our study identify interesting new avenues for investigation into tenocyte biology that have the potential to advance our understanding of how physical cues play a role in the development of tendon disorders. Despite the plethora of information available about the role of Scx in development, few studies have examined the role of Scx in adult tenocytes. A recent in vitro study demonstrated that Scx knockdown in adult equine tenocytes did not affect the expression of common tendon-related genes or the ability to reorganize a 3D collagen matrix . Several groups have reported increased Scx expression in tendons following mechanical load or injury in vivo; however, it appears that the increase in Scx expression is due to proliferation of cells from the tendon periphery and their subsequent migration into the tendon core rather than increased expression by resident tenocytes themselves [15, 26, 27]. In fact, using a murine patellar defect model and Scx-GFP reporter mice, Dyment et al. reported that Scx expression in tenocytes located in the tendon core adjacent to the injured area sharply decreased following injury and remained decreased for at least 7 days before slowly recovering . This suggests that there are at least two Scx-positive cell populations involved in tendon repair and remodeling, though their contributions to overall Scx expression need further clarification. In our study, care was taken to remove the paratenon/epitenon prior to cell isolation in order to examine the effects of Scx knockdown in tenocytes from the tendon parenchyma specifically, though we cannot rule out the presence of endotenon-derived cells. Scx expression is frequently used as a marker of tenocyte identity, but it is also expressed in other tissues [28, 29]. Tenomodulin (TNMD) and thrombospondin 4 (THBS4) are enriched in tendon compared to other tissues in humans and rats ; however, the use of TNMD as a marker of tenocyte identity in horses is less supported, as similar levels of TNMD are found in both tendon and bone  and at least one study was unable to detect TNMD expression in normal equine SDFT . In our dataset generated from passaged tenocytes, we observed low levels of THBS4 expression and undetectable levels of TNMD. Despite this, many other tendon selective genes were expressed. Interestingly, a number of these genes, including asporin (ASPN), C-C Motif Chemokine Ligand 2 (CCL2), Laminin Subunit Alpha 5 (LAMA5), and Wnt Family Member 5B (WNT5B), were significantly affected by Scx knockdown. These findings suggest that Scx plays an active role in promoting adult tenocyte identity. Exposure to Scx siRNA resulted in significantly decreased Scx mRNA as measured by both RNA-seq and qPCR. Scx is not included in the current version (EquCab2) of the equine genome annotation. Therefore, to evaluate Scx expression in our dataset, we mapped sample reads against the Scx mRNA. It is important to note that Scx mRNA is relatively small (957 bp containing two exons), GC-rich (~ 70% overall), and contains regions of stark GC content disparity, ranging from 50 to 80%. As a result, coverage across the Scx mRNA was reduced. GC bias between samples and genes in RNA-seq data are well-documented effects and there are numerous tools to account for these biases in analysis pipelines [32, 33]. Within-transcript bias is also relatively common, but correcting for it is less defined. Use of GC unaware transcript estimation methods can lead to errors in transcript abundance, especially when examining differential isoform expression . In the case of Scx, there are no documented transcript variants; however, care should be taken in evaluating the expression of Scx in transcriptomic studies, as low levels of expression may relate to bias in the sequencing technology and not a biological phenomenon. Functional annotation and GO analysis showed that Scx knockdown significantly downregulated pathways involved in focal adhesion and extracellular matrix-receptor interactions in our study. Focal adhesions are large protein complexes that form the physical link connecting the cytoskeleton to the extracellular matrix through the binding and activation of transmembrane proteins called integrins . Integrins themselves are direct mechanosensors, and upon activation facilitate the recruitment of many cytosolic proteins to the plasma membrane to form the intracellular portion of the adhesion complex . The protein talin, in particular, anchors the actin cytoskeleton to the focal adhesion by force-dependent interaction with the cytosolic tail of the β3 integrin (ITGB3) [37, 38]. Talin is a critical mechanosensor, and loss of talin impairs cell migration and extracellular substrate sensing [39, 40]. Following talin activation, the cytosolic protein vinculin is recruited to the focal adhesion and interacts with talin to stabilize the complex . Increased presence of vinculin is indicative of decreased focal adhesion turnover and more mature adhesion, which inhibits cell migration [41, 42]. Other proteins recruited in response to integrin binding, including BCAR1 and the SHC adaptor proteins, enable the integration of physical and chemical cues into downstream pathway activation in response to mechanical stimulation. Increased BCAR1 expression correlates with increased invasive potential of cancer cells, and silencing of BCAR1 or SHC3/4 results in decreased migratory ability [43–46]. Expression of both talin isoforms (TLN1 and TLN2), ITGB3, BCAR1, and SHC3/4 were decreased in tenocytes following Scx knockdown in our study. Consistently, tenocytes exposed to Scx siRNA had longer vinculin-containing focal adhesions, indicating decreased focal adhesion turnover. Despite the presence of longer focal adhesions, there was no effect of Scx knockdown on tenocyte migration on TCP. Interestingly, Scx-depleted tenocytes migrated more slowly on softer silicone membranes, whereas control cells were unaffected by the change in substrate stiffness. As many of the genes affected by Scx knockdown function as link proteins at the interface between integrins and the actin cytoskeleton, this substrate stiffness-dependent migration effect could reflect an inability to generate proper cytoskeletal traction. 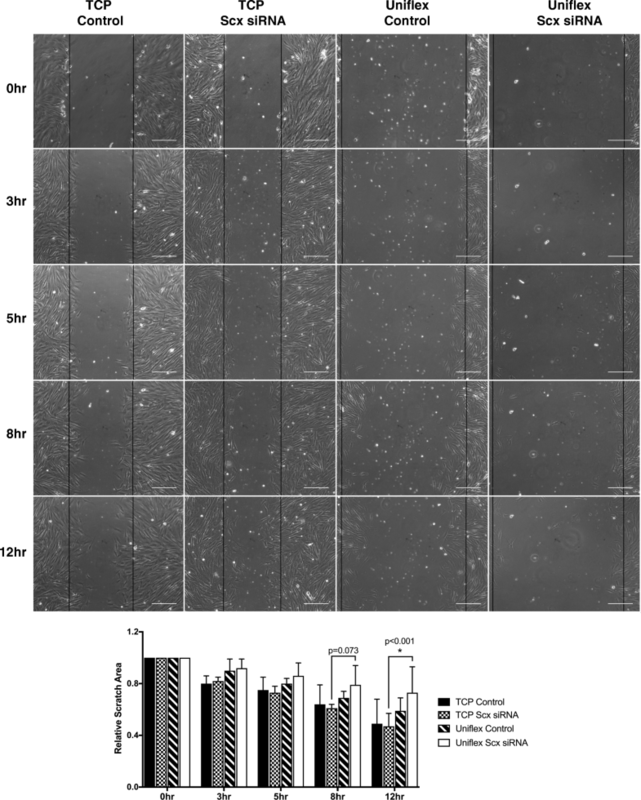 In further support of a role for Scx in modulating cytoskeletal tension, tenocytes exposed to Scx siRNA exhibited a significant decrease in cytoskeletal stiffness compared to controls. Previous studies have reported that cells alter their cytoskeletal tension in response to environmental changes in order to maintain a predetermined tensional homeostasis [47, 48]. Loss of tensional homeostasis in tenocytes leads to upregulation of MMP-13 and downregulation of COL1A1 [49, 50]. Recovery of cytoskeletal tension in tenocytes occurs through actin-mediated interaction with the local environment . In our study, we observed a similar increase in MMP-13 and decrease in COL1A1 expression, in addition to reduced cytoskeletal stiffness. Inability of the tenocytes to form adequate focal adhesion to actin cytoskeleton connections due to decreased expression of the key adaptor proteins seen in our study (i.e. TLN1/2, FLNB/B, SHC3/4) would impair ability of tenocytes to sense and respond to changes in substrate stiffness and could therefore result in reduced cytoskeletal stiffness. The relationship between cell stiffness and migratory capacity varies between cell type and disease state. In cancer, decreased cytoskeletal stiffness can be used as an accurate measure of metastatic potential, with cancerous cells being softer than the surrounding healthy cells [52, 53]. In non-cancerous cells, the relationship is less clear. A study by Kole et al. found that in normal 3 T3 fibroblasts, non-migratory cells were significantly softer than migrating cells, indicating that an increase in cytoskeletal stiffness is a prerequisite for directed cell migration . Other studies have shown that disturbed cytoskeletal architecture or connections results in cells with decreased cytoskeletal stiffness and migratory capacity [55, 56]. We observed similar cell behavior in our study, with softer tenocytes migrating more slowly than their stiffer counterparts on softer surfaces. Substrate stiffness, cytoskeletal tension, and migratory capacity are inextricably linked in all cell types. Future studies in tenocytes will help to elucidate the specific relationships and mechanisms involved. We validated the transcriptomic data by showing that Scx knockdown resulted in slower migrating, softer tenocytes; however, the pathway analysis points to a broader role for Scx in tenocyte homeostasis. Intriguingly, GO term and KEGG pathway analysis showed that a significant number of genes upregulated in response to Scx knockdown are involved in pathways related to neurodegenerative diseases (e.g., Alzheimer’s, Huntington’s, and Parkinson’s). These particular diseases develop, in part, due to dysregulation of the unfolded protein response (UPR), a homeostatic mechanism that has evolved to counter endoplasmic reticular (ER) stress as a result of misfolded proteins . Correspondingly, GO term analysis showed upregulation of many anabolic processes and a concurrent decrease in genes related to protein folding in Scx-depleted cells. ER stress and the UPR are implicated in development of organ fibrosis in heart, lung, and liver disease [58–60]. As the development of fibrotic scar tissue is a major consequence of tendon injury and the main reason for reinjury, this suggested connection between Scx and ER stress in tenocytes warrants further investigation. This study is the first to identify specific roles for Scx in adult tenocytes by exposure to siRNA targeting Scx and subsequent RNA-seq interrogation. We confirmed the biological significance of the transcriptomic data by demonstrating that Scx knockdown results in the formation of abnormal focal adhesions, decreased cytoskeletal stiffness, and an impaired ability to migrate on soft substrates. Our data suggest that Scx facilitates tenocyte mechanosensing in part by regulating the expression of several focal adhesion components and genes involved in maintaining cytoskeletal tension. Whether this is the result of direct or indirect gene regulation by Scx remains to be clarified. We also identified other genes and pathways affected by Scx knockdown that point to a larger role for Scx in maintaining adult tenocyte homeostasis. Further exploration of these novel Scx-mediated targets has the potential to advance our understanding of how mechanical strain can lead to tendon injuries. The authors thank Andrew Ford for his invaluable assistance and guidance in the atomic force microscopy studies and Dr. Roderick Jensen for the helpful discussions regarding transcriptomic analysis. This work was supported by internal funding from the VMCVM. AECN received graduate fellowship support from the Stamps Family Charitable Foundation. Publication costs for this article were supported by the Virginia Tech Open Access Subvention Fund. Data supporting the results of this study are included as Additional file 1 and are available under accession number GSE110567 at the National Center for Biotechnology Information Gene Expression Omnibus (NCBI GEO, https://www.ncbi.nlm.nih.gov/geo/). AECN and LAD conceived the study and design with assistance from RES; experiments were performed by AECN; data were analyzed by AECN, LAD, and SRW; the manuscript was written and edited by AECN and LAD. All authors read and approved the final manuscript. Collection of equine tissues for cell isolation was approved by the Virginia Tech IACUC under protocols 14–128 and 15–059. Andrews S. FastQC: a quality control tool for high throughput sequence data. Available online at: [http://www.bioinformatics.babraham.ac.uk/projects/fastqc/]. Accessed 2 Aug 2018.